Caritas Jordan and Christian parishes across the country are struggling to help tens of thousands of Syrian and Iraqi refugee, says Archbishop Maroun Lahham, the Latin Patriarchate of Jerusalem’s Patriarchal Vicar in Jordan. During a recent visit to Jordan to see Caritas’ work first-hand, Vatican Radio’s Tracey McClure spoke with Archbishop Lahham about the unfolding refugee crisis. “Caritas provides help to everybody who is in need,” says Archbishop Lahham. He credits Caritas Jordan as being the Church’s “right hand in helping all these people… Caritas Jordan thinks of everything: houses, phones, healthcare…” regardless of the refugees’ religious affiliations, he said. Ninety-five percent of the Syrian refugees who have arrived in Jordan are Muslims, since they came from the south of Syria which is mainly poor and Muslim. However, as the number of Iraqi and Syrian refugees in Jordan continues to grow, the Archbishop observes, Caritas Jordan and supporting parishes are struggling to provide resources to all those in need. The Archbishop gives the example of the King of Jordan offering to welcome 1,000 Iraqi Christians who fled from Mosul, the Ninevah Plains and Erbil, but up to 5000 have so far arrived. Additionally, according to the Archbishop, all available parish halls of all churches (including non-Catholic churches such as Orthodox, Syrian, and Armenian parishes) have been utilised, yet the numbers of refugees seeking help continues to grow. “According to the newspapers, there [are] 120 Christian Iraqis coming every day to Jordan,” Lahham says. 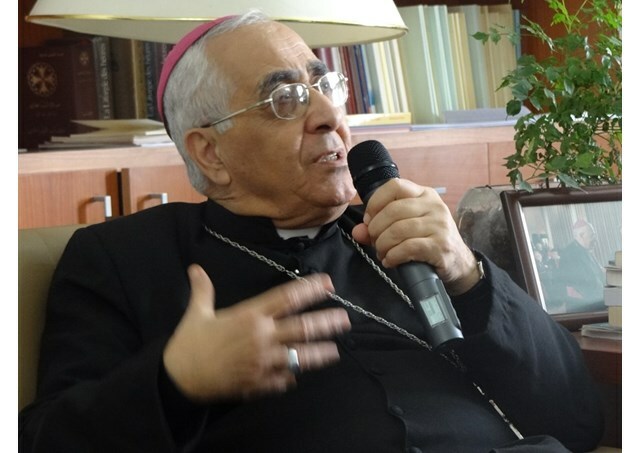 Archbishop Lahham further points out that the refugees who have arrived left their homes “with nothing but their faith,” and that “everybody dreams of having a visa to Australia, to the States, or to Europe”. Until conflict and war have ended in the Middle East, people fleeing their homes are too scared to return. Despite Western governments offering to host some of these refugees, Lahham admits this does not solve the problem. In order to alleviate the challenge of lacking resources and the growing numbers of refugees, Archbishop Lahham feels the government should intervene to a greater extent. “I think that a meeting should be held with the ministry of social affairs in order to see what the government can do at least to give shelter to these people who are here,” he says.